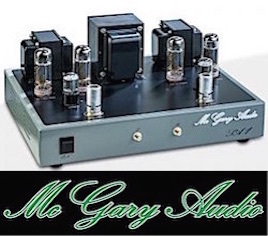 Everything Audio Network: Audiophile Review!Benchmark HPA4Headphone Amplifier/Line-Stage Preamplifier:"Precision Volume, Pure Transparency"
Wow Factor: really hear your HPs! In the 23 years I have been reviewing Benchmark audio products, the company’s design moniker has always been clean, accurate sound. 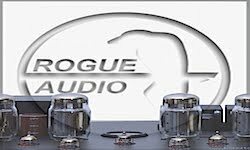 With the company’s pro audio origins, you would never hear a less than revealing, or a colored audio device out of the Syracuse, N.Y. factory. Hence, their latest product, the marvelously open and clean high-end headphone amplifier/line stage, the HPA4. It is one of the most transparent audio products I have ever heard at any price. This new custom designed, 256-step relay volume control HP amp/line stage is incredible in its transparency and ability to get out of the way when listening to accurate sources with accurate headphones. Just as impressive, the line stage delivers volume control that many an esoteric analog or digital preamp could only dream of. Priced at $2,995, the HPA4 is a co-design by Benchmark and THX, Ltd. using the THX Achromatic Audio Amplifier (AAA™) technology that was implemented in the Benchmark AHB2 amplifier a couple of years ago. According to Benchmark, the THX AAA™ reduces harmonic, intermodulation and crossover distortion by 20 to 40 dB to guarantee a realistic and fatigue-free listening experience. According to Benchmark, it accomplishes “ultra clean” sonic delivery (.00006 percent distortion and an A-weighted S/N of 135 dB!) using a patented, feed-forward topology to null conventional distortion and noise mechanisms. I cannot stress enough how the HPA4 just gets out of the way so you can listen to your music and the components in your chain. The HPA4 is sonically neutral, distortion free and deeply dynamic. At any level, it will let the music shine through with no added color. The THX AAA circuit allows the HP amplifier to reach its maximum output power and sound pressure level (SPL), without producing the distortion that normally accompanies increased output levels in traditional amplifiers. Benchmark Vice President/Chief Designer John Siau said the THX-888 amplifier is driven by a custom-designed Benchmark line amplifier that features relay-gain control, relay input selection, and relay muting. The line amplifier incorporates the finest gold-contact relays available. The rotary relay gain control features 256 steps in 0.5 dB increments. 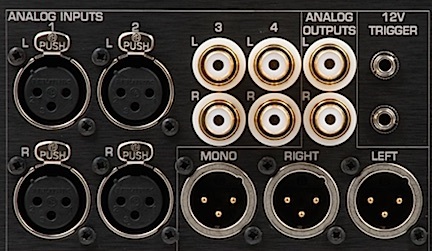 The HPA4 includes four independent 256-step attenuators: two for the left and right headphone outputs, and two for the left and right line outputs. To make this all happen, the HPA4 includes a total of 64 precision NEC relays. The volume control knob features a high-quality, optical encoder that is rated for heavy use. An acceleration feature makes it easy to move through the 256 volume steps while maintaining 0.5 dB/step resolution. A press of the control knob toggles between headphone volume, line out volume, or both. Siau said the volume control’s relay closures are precisely timed to deliver silky-smooth volume changes. “No other relay gain control offers this level of precision and performance,” he noted. The HPA4‘s headphone output sports a 1/4-inch TRS and a 4-pin XLR. Benchmark recommends, when possible, use of the XLR inputs, due to the lower contact resistance. The HPA4 features two balanced stereo inputs and two unbalanced stereo inputs. The line amplifier provides one balanced stereo output, one balanced mono sum, and one unbalanced stereo output. The HPA4 includes IR remote control and can be operated using the optional Benchmark remote ($100). You can use it with Benchmark’s highly rated DAC3 converters, as well as any other source with an analog output. When paired with a Benchmark DAC, a single remote control will operate both units. Setting the DAC’s volume controls to 0 dB (or bypassing its volume control altogether), then relaying the signal through the HPA4 nets an ultra HP accuracy at any level that is extraordinarily clean. Besides the impressive performance, the HPA4 is Benchmark’s first product with a LCD touch screen that enables most functions of the unit. The screen provides access to advanced features such as balance control, input level offsets, input names, screen dimming, remote control, and function locking. Help screens explain the special functions. The HPA4 includes independent on-screen mute buttons for the headphone and line outputs. Both can also be muted with the volume knob or with the optional remote control. The inputs can be renamed and unused inputs disabled. Input levels can be trimmed to provide exact input-to-input level matching. The LCD’s brightness level is adjustable, and timers can be set to dim or shut off the display. The screen also can be locked to prevent access to the advanced features, such as balance and trim. The 3RU tall HPA4 is available with a black or silver faceplate and is designed to match the Benchmark AHB2 power amplifier. It occupies the same width and length footprint as the Benchmark DACs. The case features a milled faceplate and milled sides. Top, bottom, and rear panels are made from thick aluminum and feature a brushed texture. Operationally, the HPA4 features two bi-directional 12V trigger ports that can be used to link the HPA4 with external D/A converters and power amplifiers. The trigger signal controls the power-up and power-down sequencing of the entire audio system. In my opinion, the key to a superior volume control is how it sounds when you turn it down. Most good volume controls (analog or digital) can sound pretty good when you turn them up, if the distortion is low and the HPs or speakers can handle the level. Turning down the volume control — to accommodate optimum listening without killing your ears — often correlates to reduction in accuracy. Little bits of information may disappear or get changed when turning down the level. A really good volume control should reveal the audio, but in its reduced level state. You should be able to hear the gentle room reverb of drum cymbal or ringing piano note decay as you turn the volume down. With many DACs with digital volume controls the subtle detail, natural space and air that a good recording contains gets reduced or disappears, when you turn down the volume. Some still truncate the digital resolution The newer 32-bit digital volume controls are better, but I still believe that a well-designed, analog volume control, such as the Benchmark HPA4 with its precision relay and ultra quiet amp section, sounds the same at reduced levels as it does when it is turned up. During my review. I auditioned the HPA4 in numerous configurations for headphone listening, driving amplifiers and even as a front end for an A/D recording setup that needed more gain. Plenty of uses for a preamp this quiet and accurate. 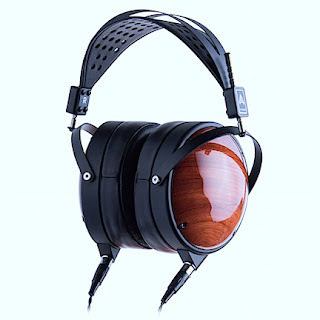 For headphone listening, I had a long list of demo cans, including my AKG K702 Anniversary, Sennheiser HD-650, AKG K812, Oppo PM1 planar magnetic headphones and the Audeze LCD-XC. DC Head-Fi Chapter Member Amar Rajvanshi, an avid headphone listener and designer, also brought over the Sennheiser HD-800, his own custom-designed open back Auroras Borealis, the ZMF EIkon and a HiFIMAN HE6. As a line stage, I connected the HPA4 to several amps including the aforementioned Benchmark AHB2 (bipolar), a Pass Labs X30.5 (MOSFET), Rogue Audio’s hybrid tube Class-D Medusa, and even an old, original McIntosh MC275. Other HP amps included the Oppo HA1 and a Bryston BHA1, which are much lower in cost. Sources included Macbook Pro with Audirvana Plus software player, Oppo BDP-205 universal player, and a TASCAM DA-3000 professional Hi-Res stereo recorder player. 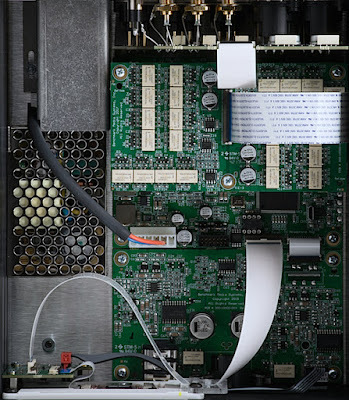 Playback DACs were numerous: the Benchmark DAC3, Mytek Digital Brooklyn Plus and Manhattan II, Prism Callia and a TEAC UD-503. All the DACs had onboard volume controls. 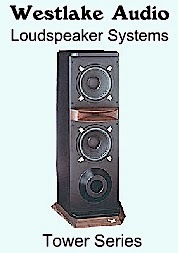 For the HPA4 and line preamp output listening sessions, I listened via MartinLogan Impression electrostatic speakers — and the Westlake Audio Tower 5 and Lipinski L-505, both very accurate point source speakers and good analytical tools for evaluating electronics. All wiring was done through Wireworld Eclipse line of analog and digital cables. Essential Sound Products Essence II power strip and cords connected all the gear to the AC. With the first play of the DMP Label’s DSD title track of Warren Bernhardt — So Real, as played via the Macbook Pro/Audirvana Plus through the Benchmark DAC3-HGC output connected to the HPA4, I could immediately hear how accurate the new HP amp is. The DAC’s precise DSD decoding delivers the recording’s pristine, airy, brushed drum cymbal tone with the brilliant Steinway piano and bass pulsing the rhythm. 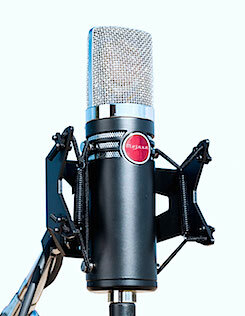 The minimalist mic technique, direct DSD recording chain and no post-processing showcases as close to live as you can get with a recording, and the Benchmark HPA4 delivered that transparency at any volume level. As good as the DAC3 (and Mytek DAC volume control in the HP amps are), the musical closeness and transparency is not quite there when reducing the respective onboard volumes. Setting the DAC’s volume controls to 0 dB or bypassing its volume control, then relaying the signal through the HPA4 nets an ultra HP accuracy at any level that is extraordinarily clean. When I turned down level, I could still hear the exquisite, precise imaging of the brushed drum cymbals, the snare rim shots and the tasteful Steinway piano notes. I am talking about real musical accuracy, not some euphonic coloration definition of being musical. I am talking about the way music sounds live in a great room, dimensional and full. That is what I hear from the HPA4. I played the cut umpteen times with various headphones; AKG K702 Anniversary and the Audeze LCD-XC saw a lot listening time with their expansive imaging and transient energy, and Amar’s own open-back design Aurora Borealis. were incredibly airy and accurate as well. Really comfortable. The HPA4 handled all of them with ease. The music was relayed and passed through the HPA4 via the unique audio character of each HP, but most sounded quite good. To my ears, the HD-800 had a slightly spiky, low treble character on some material, but the imaging was detailed and amply spaced. The HD-650 was more neutral. Amar was impressed by Benchmark’s dynamic accuracy. “With the Benchmark, the HP amp just gets out of the way so you can listen to the music, the source and the HPs — without any color from the amp. It is really good.” We both noted how musically precise and audibly truthful the “So Real” track sounded through his custom-designed ‘phone. I switched to the 24-bit upsample of Charlie Byrd’s “Ring Them Harmonics” (The Guitar Artistry of Charlie Byrd). Love those percussive, nylon string pick leads from this 1963 recording as it interplays with the drums. Other than the hiss, it is quite dynamic and revealing. Again, the HPA4, revealed that ample spread of the instruments with an open width and depth that my AKG K702s can deliver. This vast stereo image, fast dynamic response and accurate musical reproduction via the HPA4 were confirmed by my HD-650, the AKG K812 and the Audeze LCD-XC. There are varying levels of frequency emphasis on all these headphones, but overall, the HPA4 revealed them all to a positive listening experience. The HPA4’s volume control also enables one to also get great sound out of far less expensive pieces of audio gear, provided you have a good audio path in the 0 dB or bypassed mode. Because the Benchmark DAC3 and the Mytek Brooklyn + DACs are so good in the 0 db or the bypassed mode, their satisfying playback is expected at their price range. However, I found that with the HPA4, a $1,000 source also sounds really good using the HPA4 as the HP amp or as a line stage preamp. For instance, TEAC UD-503 is a great-sounding, budget DAC via the line out to a preamp when setting the volume to 0 dB. The internal digital volume control, however, loses some sonic resolution when you turn it down. But the sound of the TEAC’s AKM DAC chip was quite good when when running its fixed line 0 dB output into the HPA4 and listening with my AKG K702s. The AKM chips are pretty close to the ESS Pro. Ditto when using the HPA4 as a line stage with TEAC. I switched to Classical music on the Audeze LCD-XCs and played the SACD-to-DSD file transfer of Arabella Steinbacher — Bela Bartok’s Two Violin Concertos on Penatone. This violin recording has a rich string harmonic persona from the Stradivarius and a spot-on recording set up in terms of orchestral/violin balance. With the AKG K702/HPA4 setup, the violin’s impression was so live like. Turn it up or down, the image, outer-edge instrument detail, the focused solid center image never changes. It is so involving listening to headphones through the Benchmark HPA4. The HPA4 also comes in silver. Touch control LED is brilliant. As a line-stage, the HPA4 was quite adept at delivering this pristine live to two-track violin/piano DSD recording. The instruments are perfectly placed, the music impeccably played with a fleshed-out violin tone and very percussive piano signature from Mr. Minaar. It showed you how good the now-defunct Oppo player is with Hi-Res. The ESS Pro 9038 DAC chip has incredible resolution, and using its fixed output with the Benchmark HPA4 reveals all the detail this recording possesses. Playing this SACD and countless other Hi-Res recordings showed how transparent the HPA4 line stage really is. If your source of music sounds less than Hi-Fi, don’t expect the HPA4 to “colorize” it for the better. It is a brutally honest preamp/headphone amp that will show you the weak links in the audio chain. I found myself relying on the HPA4, as well, for other product reviews because it is so transparent. 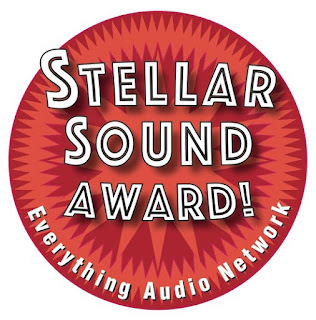 From an accuracy standpoint, it sounds better than $20,000 preamps I have heard. And oh-so clean. Using it with the under review First Watt F1, as well as my standby amps — Bryston 14-BSSTII and even the Rogue Audio Class D/hybrid Medusa, — my Hi-Res recordings could not have sounded better through another preamp. Now if your source of music sounds less than Hi-Fi, don’t expect the HPA4 to “colorize” it for the better. It is a brutally honest preamp/headphone amp that will show you the weak links in the chain. For example, with a 1994 Denon CD player as the source, I could clearly hear its sonic edginess in the midrange and treble while playing an old 1980s GRP jazz recording. Those early 1990s DACS were often shrill sounding. The HPA4 showed the CD player as it really is. Yuch said my ears. 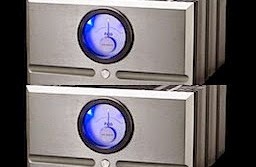 However, when I digitally connected the Mytek Brooklyn Plus or the Benchmark DAC3-HGC to the same player, then connected it to the Benchmark HPA4 as the line-stage preamp, the old GRP CD album sounded like a million bucks. Didn’t sound shrill at all. I should say that, ergonomically, the HPA4 performed flawlessly, the on-screen source selection, volume preset, balance, mute and gain menus allowed me to tweak the HP amp for a variety of different sources and HPs. It is very easy to use in terms of set up. I love the on-screen mute for either line or HP output or both. A handy feature of the HPA4 is its ability to change the input gain by using the Boost function, for very precise level matching of sources, etc. Or if the source level is too high or too low. It allows +10 dB, -10 dB in half dB steps. Very handy. Every preamp ought to have that feature. 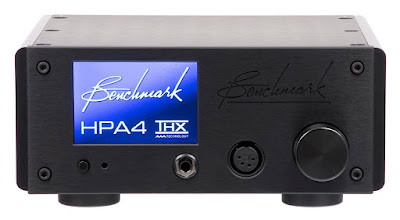 The Benchmark HPA4 is one of the most transparent headphone amps I have ever heard — at any price. Just as impressive is the line stage, which delivers volume control that many an esoteric analog or digital preamp could only dream of. Other useful menu adjustments include the separate L-R balance in .5 dB steps for both the line and HP outputs. And there is a -20 dB “Dim” mode for answering the phone, or when the wife says time for dinner. With the precision relay potentiometer, you will love the clicky feel of the analog volume control. It felt so solid and substantial that I never used the remote except to see that it worked. I loved to crank it up and feel the clicks. Speaking of cranking up, the HPA4 feels like it is always cranked up, in terms of heat; this bad boy runs warm if you leave it on all the time. Combo it with a warm-running DAC stacked on top and you got some heat. Not super hot, but noticeably warm. To say I am impressed with Benchmark HPA4 would be an understatement. One of the best HP amps and line stages I ever have heard in terms of transparency and accuracy. The ultra-low distortion, its ability to drive any headphone, plenty of connections and the cool factor of the LCD screen menu selection: it is darn near perfect. 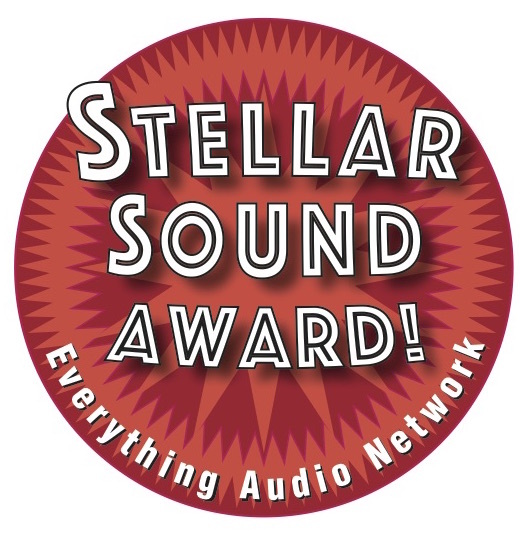 Based on my impressions, the Benchmark HPA4 receives two Everything Audio Network Stellar Sound Awards. One for its headphone amp and one for its line stage. Folks, it is that good. Thank you for a detailed review. I just got my HPA4 yesterday, and I can already hear terrific improvement at regular listening volumes with my DAC3 and AHB2 through Harbeth 30.1 Anniversary monitors. Plucked acoustic bass notes are more textured and bass timbre is more rich (e.g. real). There is better soundstage depth at regular listening volumes, and cymbals have a more realistic shimmer and natural clarity. Everything is more easily discerned in the mix. In one piece of choral music I very easily clearly heard individual voices located in space without having to concentrate on listening. 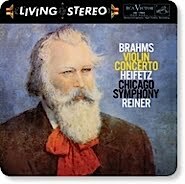 The ease and naturalness of this degree of clarity and realism makes listening fatigue free and full of fun discoveries. I was concerned that adding the HPA4 into the system with the DAC3 and AHB2 would not give me much improvement. I think the Benchmark site significantly understates the difference the HPA4 makes. As you mention in your review, even the good 32-bit digital attenuator in the DAC3 affects the important fine details at lower (regular, for me) listening volumes. I do have two nitpicks with the HPA4. The biggest is that the left/right balance cannot be controlled via the remote. For folks with pets or children who often displace them from a central listening position, being able to adjust the balance remotely is very very helpful. I had this on my Vinnie Rossi LIO pre-amp and it was great. The adjustment is definitely possible remotely with the HPA4, Benchmark just needs to let me assign a couple of keys to it. I never change inputs, for example, so I'd be glad to have those arrows for left/right balance. The second nitpick is the manual's instructions for setting up the DAC3 with the HPA4. Maybe I missed it, but I didn't see the advice that the DAC3 should be placed in Home Theatre mode (volume bypass) for use with the HPA4. It was a forum review (on WhatsBestForum) that alerted me to that. Those points aside, the HPA4 exceptional. Your observations pretty much echo mine. I used the HPA4 with more amps and DACs, but came to the same conclusion. It is about as accurate as I have ever heard a HP amp and line stage. Even the lower cost DACs sound good through it. If we could all listen at 0 dB from our sources, we would not need a volume control. But since we cant', products like the HPA4 are our salvation.